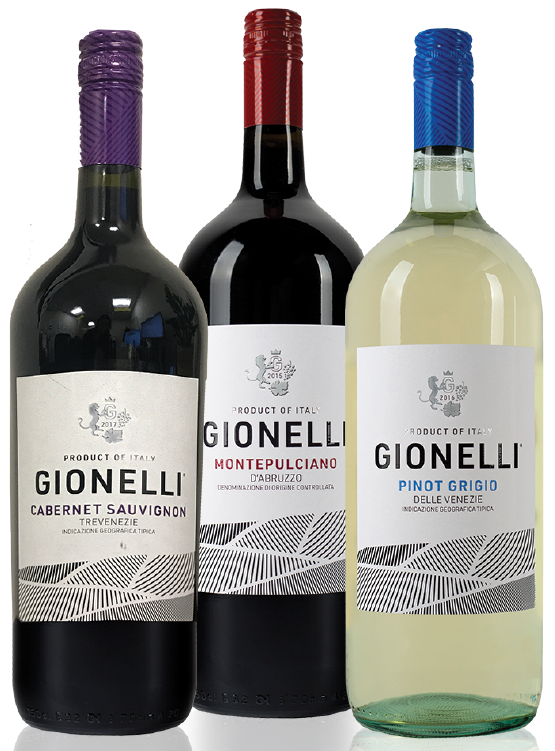 This line of classic Italian wines from the Gionelli family includes a Cabernet Sauvignon, Montepulciano and Pinot Grigio. The Cabernet has aromas of dark fruits with hints of vanilla, pepper, and spices. The Montepulciano has fresh fruit flavors with hints of cocoa powder and vanilla. The Pinot Grigio is a silky smooth wine with light floral aromas. Flavors of honeydew and pear and a crisp clean finish. Suggested retail for each 1.5L bottle is $12.99. AVAILABLE FROM Trio Wine Company.